We do understand that there can be times when your boat is down and needing priority service is very important. Our team strives to do this every day. If you need to be picked up and do not have a trailer, do not worry – we can usually supply one for you. Our techs are continuously in training for product information. Yamaha and Mercury education is very important to you, as we will be able to offer better assistance on old and new technology with better-educated techs. Simply fill out the form below and we will get the information to the right person. 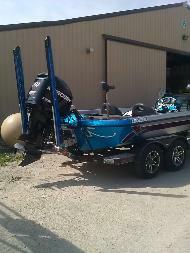 Storage of your boat, pwc, motorcycle, and RV is offered by Action Marine. Our buildings are cement floor for inside storage which keeps the rodents out over the winter. We are also monitored by Alarm Detection Services and are notified by the alarm company if anything suspicious is going on. Giving you the added protection and security. If having your unit inside is not important to you, we also have room for outside storage and offer shrink wrap. Many of the items we store are outside and are still monitored. Currently, we are working on expanding our lot so that we can offer more room for outside storage. You have the option of winterizing your vehicle or having our certified staff do this. You may also want to drop your unit off or have us pick it up. We are a company continuously looking for ways to better serve our clients.